The Galleries section in each issue will showcase the work of several young photographers - some up-and-coming, others already well-known and celebrated and all of whom have attended World Press Photo seminars. Ziyah Gafic is a multi-award winner even though he is still in his early twenties. Much of his work to date has concentrated on the aftermath of war, in his homeland in the Balkans and elsewhere in the world. "I'm always trying to bring the subject closer to the viewers," Ziyah has said. "We can't ignore the fact that Chechnya, Palestine, Rwanda and all other unhappy countries are part of our world, and that's not the impression you always get from the photographs." 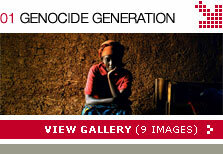 His featured images are the result of a recent visit to Rwanda, 10 years after the genocide in which hundreds of thousands of people perished. 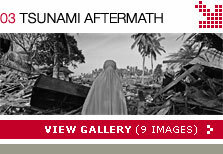 Ernest Goh flew to Banda Aceh immediately after the tsunami which struck on December 26 2004, spending several weeks documenting its aftermath. The award-winning 26-year-old former Straits Times staffer and World Press Photo Asia-Europe Forum for Young Photographers attendee in 2003 was traveling as a volunteer with the NGO Mercy Relief, from his native Singapore. Tanja Valic, a 36-year old photojournalist from Belgrade, grew up in what she describes as �bad times - war, protests and poverty�. And she learnt her craft on the streets of Serbia and Montenegro during those troubled years. But her ambition, even as a girl, was to be a sports photographer and her shots in her home town are designed to show another side of life in the Balkans. �We have good athletes here and I want to show that, � says Tanja, who attended World Press Photo workshops in Sarajevo and Skopje in 2002 and 2004. �When all the bad things stopped, I wanted to present the better side of my country�. Award-winning Manish Swarup is a senior photographer working with The Associated Press who has traveled to Kosovo in Yugoslavia and war-torn Afghanistan and Iraq on assignment. However, he also loves taking portraits and capturing scenes of nature, art and culture. For the portfolio featured here, Manish was in his home country of India recording an ancient Hindu ceremony, Lathmar Holi .
" It' s a colorful and age-old tradition which made me want to click, " says Manish of the event.